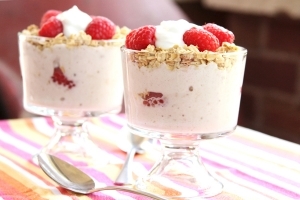 Simple to make and delicious enough to transform dessert in to brunch! Chop the bananas into about one-inch segments. Place flat in a sealable baggy and freeze over night. Remove the bag from the freezer and let the bananas soften before adding to a food processor or blender. Mix on high for about 5 minutes until it turns in to a creamy, ice cream-like texture. In four bowls or glasses, divide the banana ice cream. Top each bowl with 1 oz. raspberries, 2 Tbsp. granola, 1 Tbsp. Greek yogurt, and 1 Tbsp. of our homemade chocolate sauce.